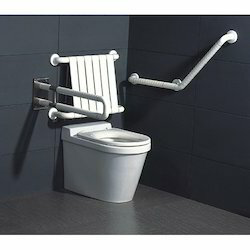 Offering you a complete choice of products which include bathroom handicap grab bar and handicap grab bar. Handicap Grab Bars are usually installed in handicap toilets for providing support to the disabled. The person with disabilities uses handicap grab bars to maintain balance, transfer and prevent falls. One or more bars can be installed vertically on bathtub walls or in shower stalls. Can also be installed vertically near toilets and commodes to aid in getting on and off a toilet seat. The plastic grips have grooved inner surfaces for a safe, non-slip grasp. Suitable for home, institutional, or hotel use. Includes hardware and instructions for installation. 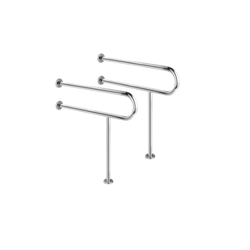 Available with us is a comprehensive range of Handicap Grab Bars. Installed widely in handicap toilets for providing support to the disabled, these bars are manufactured using optimum quality raw material at our vendors end, in compliance with international quality standards.